The week has gone by so quickly I feel like I am still spinning. I worked on CHA stuff most of the week and then took a couple days off at the end to visit with my very good friend Ree and her family, that came all the way from Sydney for a holiday. 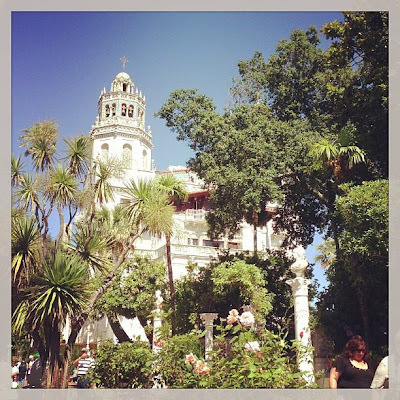 We met them on Thursday at Hearst Castle which is about an hour and a half north of where we live. I have been to the castle many times over the years but I have to say, the gardens were more beautiful this time than I have ever seen them. Add in great friends who make you laugh, gorgeous warm weather and it made for a great weekend. I admit we were sad to see them go yesterday afternoon! I think this might be the photo of the weekend. Ree hugging a stack of tim's fabric. Only a few more weeks until it's available! Well, enough about me...on to today's project. A simple card made with the Sizzix Alterations Pocket Watch Frame. Follow along and I will show you how I did it. I wanted to use some flowers I had. They were not the right color so I took care of that with some Distress Stain. I cut the flowers apart and smashed them down a bit, then colored them with Picket Fence. After drying them a bit with the Heat it tool I went over them with Brushed Pewter then set them aside to dry while I assembled the card. 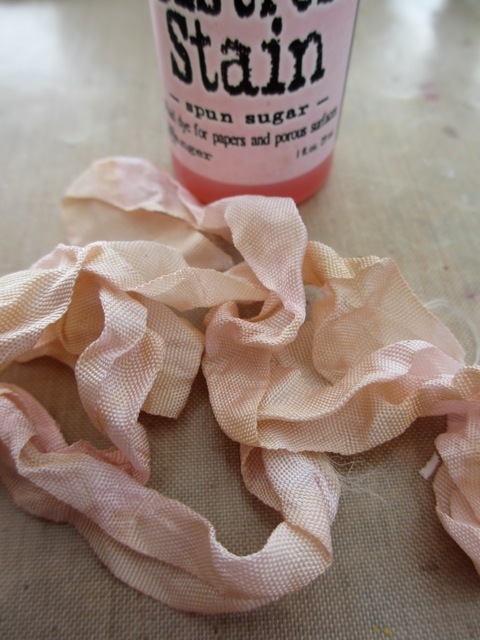 I know I will need some ribbon so I colored Crinkle Ribbon with Spun Sugar. 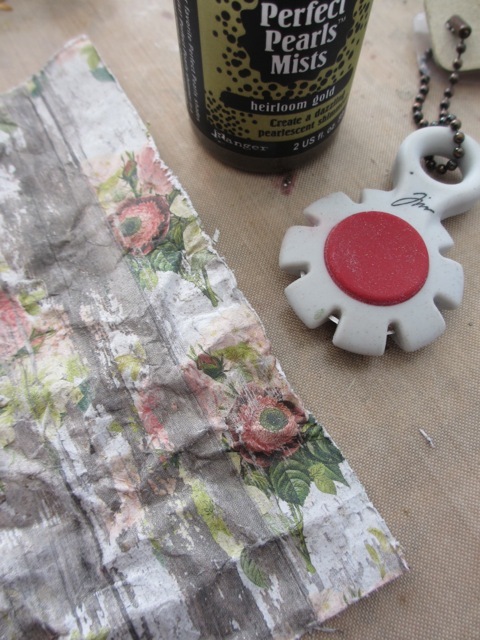 Once dry, I added a little Vintage Photo Distress Ink to my craft mat, added a spritz of water then rolled the ribbon around in the mixture to give it a vintage feel. 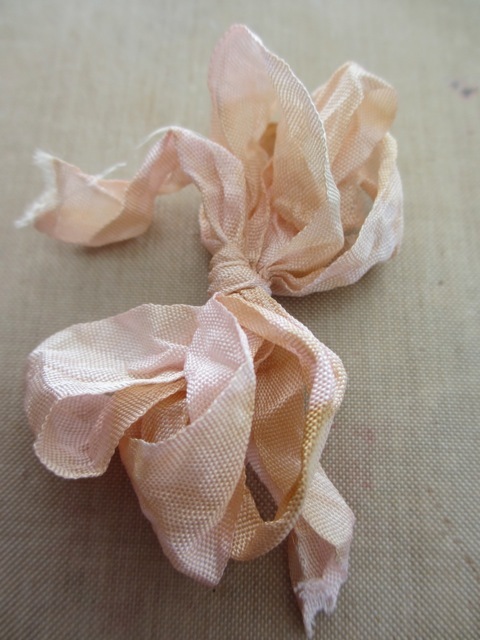 I dried the ribbon with the Heat it tool then created a bow to add later. Three loops on each side. The foundation is a piece of Core'dinations cardstock cut 6 x 12" and folded in half to make a 6 x 6" card. 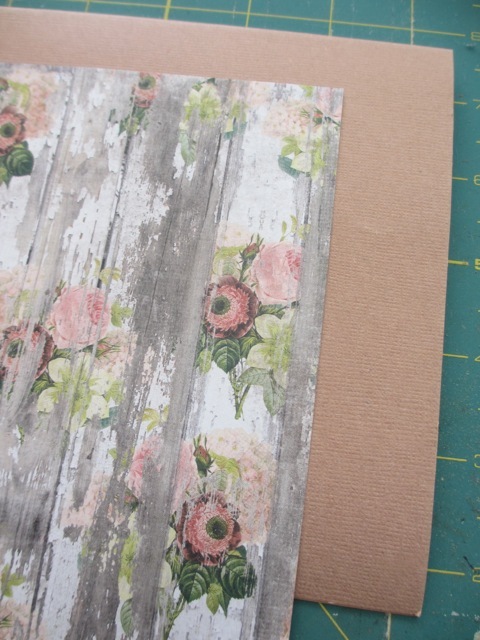 I pulled a piece of My Minds Eye paper from one of their 6 x 6" packs I purchased at Michaels and cut it 5.5 x 5.5", just smaller than the foundation. 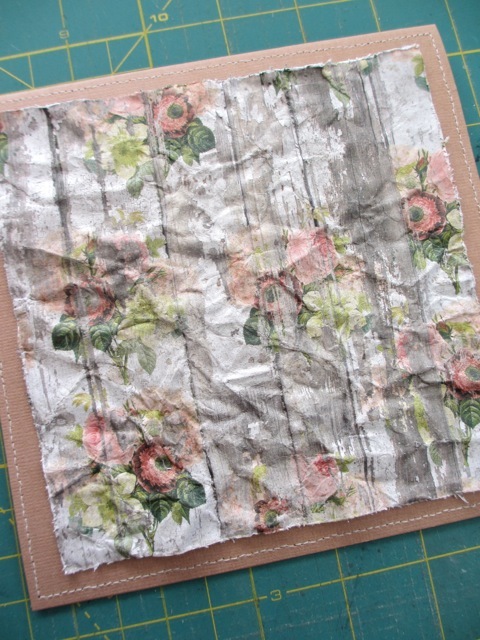 I wanted to distress the patterned paper so I used the Tonic Paper Distresser to rough up the edges. Then I lightly sprayed the paper with water on both sides and crumpled it into a ball. I unfolded the ball, smoothed out the paper and dried it with the Heat it tool. Once dry, I sprayed it with Perfect Pearls Mist - Heirloom Gold and dried it again. Gosh, that sounds like so many steps but it really took less than 5 minutes to complete. I stitched around the front of the card foundation then added the paper to the center with Wonder Tape. Over to the Vagabond machine to cut the Pocket Watch Frame out of Grungeboard. 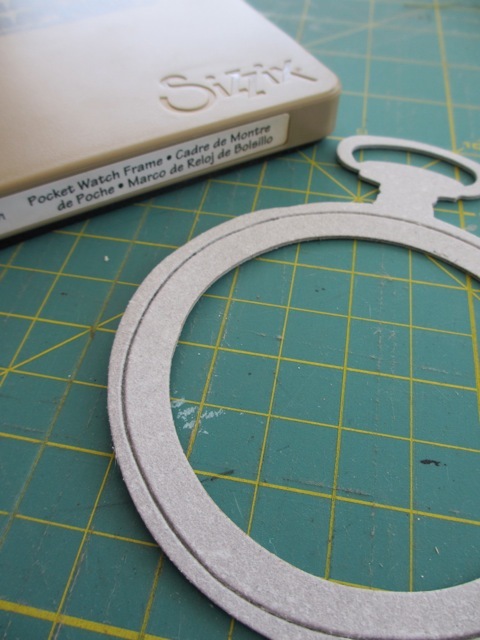 I probably should say that when you cut the Pocket Watch Frame the center is solid. Mine is cut out because I added the largest of the Sized Circles to the center of the die before cutting. A magnet in the circle keeps it in place while you are cutting. Once cut, I painted it with Distress Paint (wait for it to dry) and then Slate Alcohol ink. 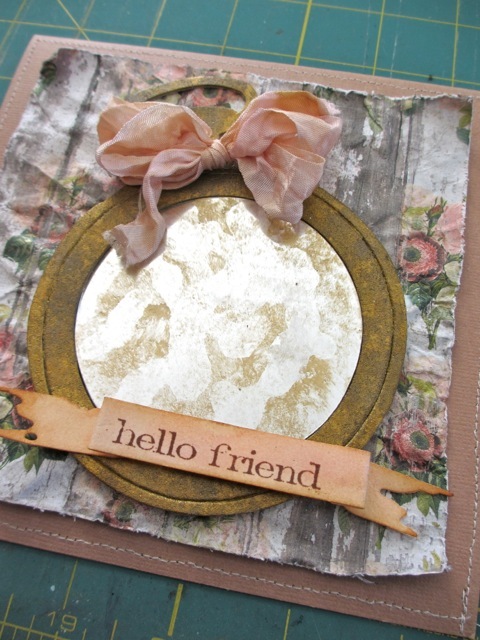 Add the Pocket Watch to the card front at a slight angle. I decided I wanted a piece of Mirrored in the center of the Pocket Watch so I used the same Sized Circle (that I used earlier in the center of the Pocket Watch Frame) to cut the Mirrored piece. 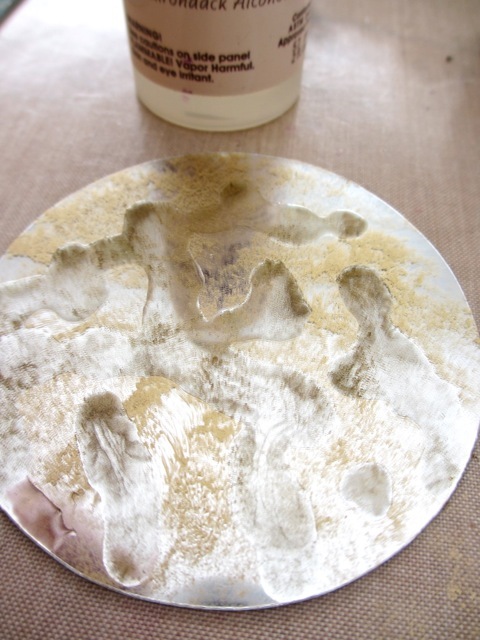 Once cut, I used gold mixative Alcohol Ink (remember to shake before use) and a felt pad to pounce the gold color on the Mirrored circle. 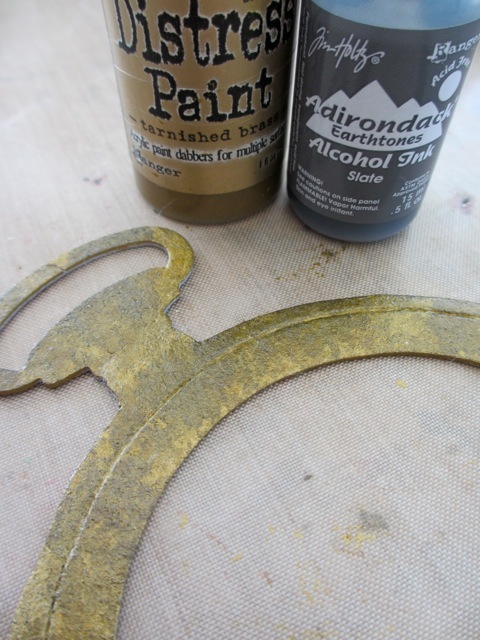 Once dry, I dripped Alcohol Blending Solution onto the surface. 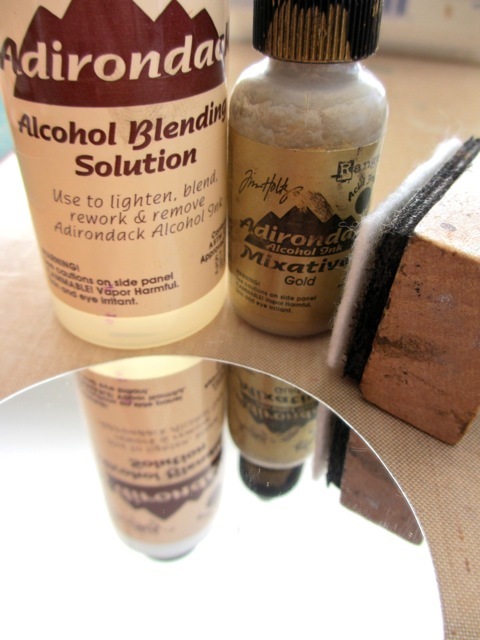 If you have used this product, you know that it will remove alcohol ink so be careful how much you drip on or else you may just have to start over. Let it move around a bit and then dab it up the excess with a paper towel. This product can be very strong smelling so always use in a well ventilated room. 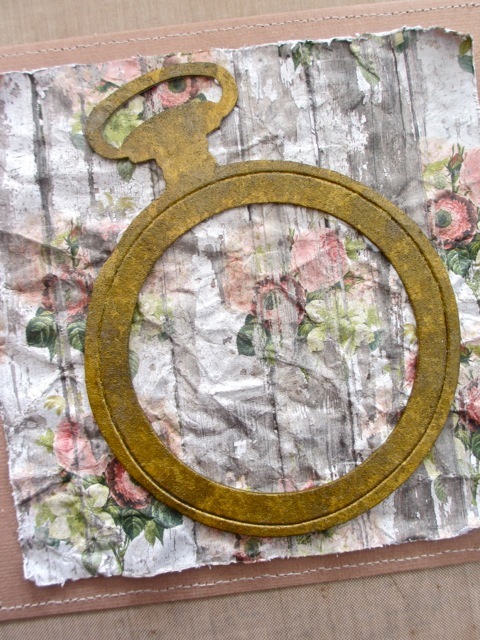 Add Mirrored circle to the center of the Pocket Watch and bow at the top. I cut a Tattered Banner and colored it with Spun Sugar Distress Stain and inked the edges with Vintage Photo Distress Ink. 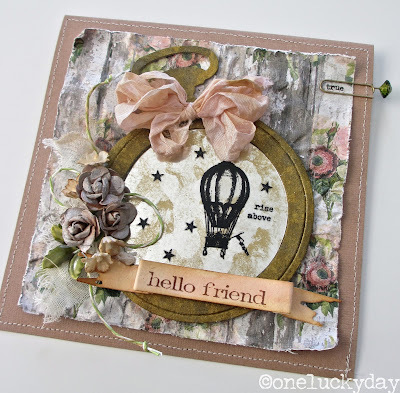 The saying is from the Stampers Anonymous Simple Sayings stamp set. 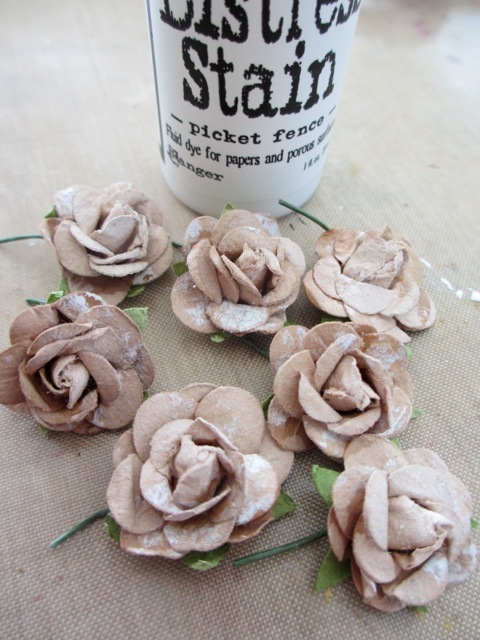 I added a small piece of cheesecloth with white glue, then green striped Paper String. Just staple into place with the Tiny Attacher. I chose some Remnant Rubs from both Elements and Words for the center. On the top right side I added a Gem Clip I colored with lettuce and gold Alcohol Ink. The gold mixative makes all the difference in the Gem clip looking like it fits the project. And the last layer...the flowers I colored earlier. 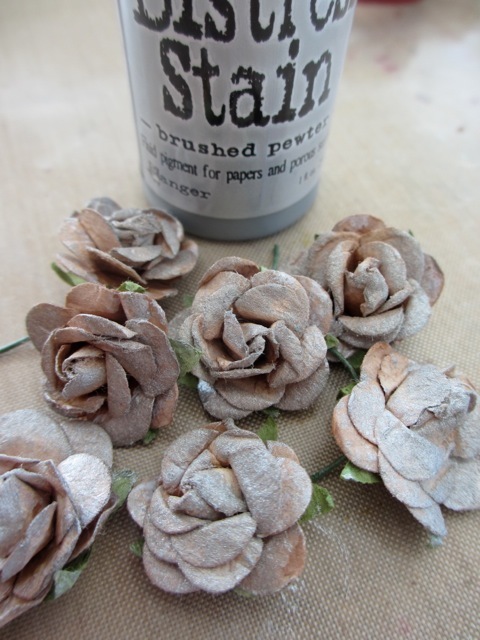 A few small flowers for contrast and metal leaves from the Foliage set colored with Alcohol Ink. Done. Love how feminine the card turned out. 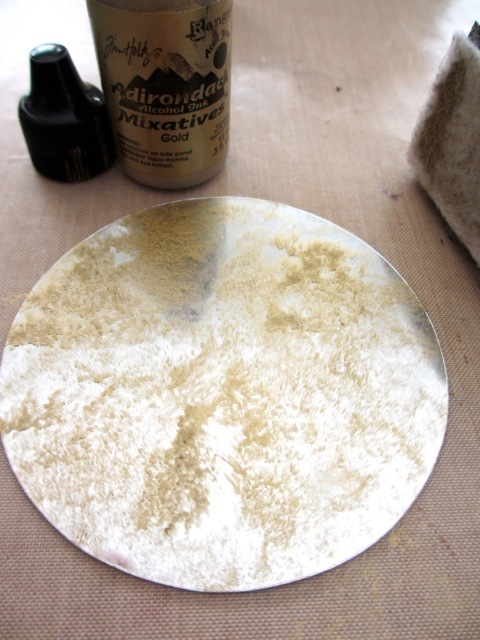 The gold mixative on the Mirrored product is a technique I know I will use again in the future...super easy and brings a cool result. I guess experimentation with mediums is always good. Well, back to finishing my CHA preparations now. I can't believe that in one week I will be in Vegas starting to set the booths (yes, it's more than one). I still have a bit to do before Friday rolls around, but I will say... the artist samples for the booth are stacking up quite nicely. Between that and the props "someone" keeps sending to my house, I may need a U-haul to get there. I also hope you have been keeping up with tim's posts about the new Idea-ology releases. So much to be excited about...the little domes are super fun, the new Seasonal Remnant Rubs (a must have), the Mirrored stars, the new Worn covers....and those tiny skates! I see some great Seasonal projects in my future! thank you Rita! I always like getting my hug from Scotland! Well your ladder was a hit the last time, so a U-haul might be required! 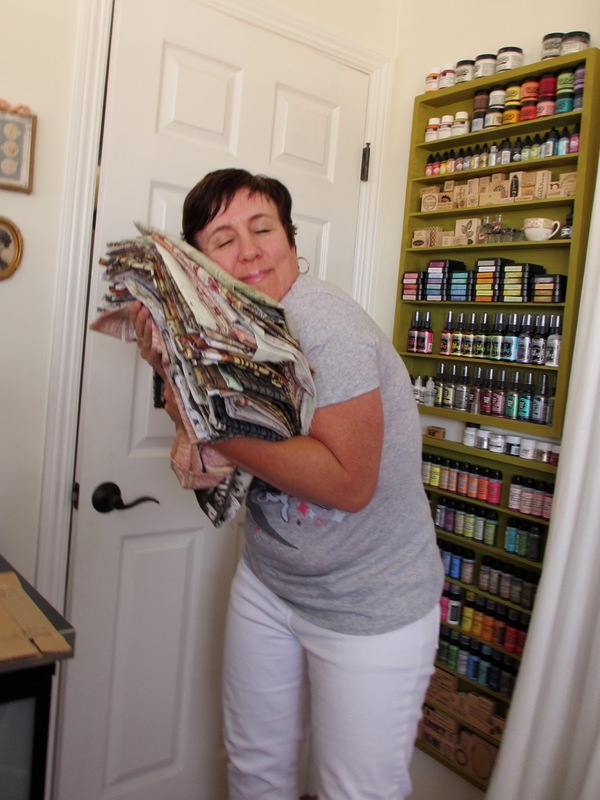 If that were me holding the pile of fabric I would be a blur as I ran down the road with it to go make art! oh, she tried, Belinda, she tried! Wow! Stunning card! You have a lot of fun stuff going on. Don't forget to breathe and have fun at CHA! Thanks Dee! and thanks for the reminder to breathe and maybe stop and remember what a great blessing my job is! This is such a beautiful card. Would love it if you showed me how you got that perfect 3 loops bow! thanks Valery! Maybe I need to figure out how to use my video camera to record the tying of the bow since I get so many questions about how to do it! This is such a beautiful card, Paula!!! Can't wait to meet you at Inspiration Unlimited 2013! I am attending for the 1st time and coming all the way down from Puerto Rico! I'm so excited!!! Anelsie, Looking forward to Sept and meeting you! Yes, Paula, we want Videos! I learn so much better by watching than from reading. I do Love your Blog and am so thankful to have found you. Today's project is gorgeous and the tutorial is awesome. I love learning new techniques and today there were several. Thanks so much!! Videos are like fear factor for me Laura! I better practice before I post anything, lol. WOW! What a wonderful card - love that you included all the steps for your creation! Thanks so much for the inspiration and have a wonderful time at CHA! Beautiful friend, beautiful fabric ;0), and beautiful make! Love the antique feel on the mirror! Gorgeous! I love that fabric and the flowers! What a great feminine take on the pocket watch! Your attention to detail really takes your projects up a notch. I have to tell you that I am loving your quote from your last post, so much so that I scribbles it on a scrap of paper and have it pinned to my board at work where I can look at it. Thanks! Could this be any more wonderful? I especially love the paper clip detail. Paula can make 'anything' special. 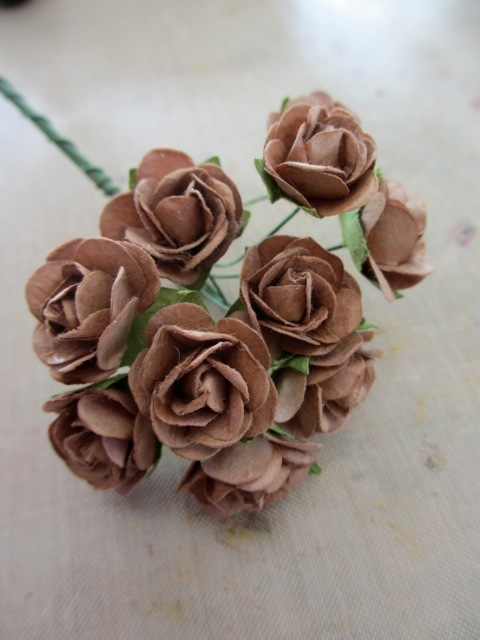 What a beautiful project and such a fabulous step by step thank you! Lovely Paula, simply lovely. Thanks a million for sharing. I do love this project! It's just so pretty.